Hook choice: This is down to preference really. I prefer to choose curved, grub hook. My preferred choice is the TMC2457 or TMC 2488. I prefer to use size 14 down to size 22. A straight hook can also make a good looking fly, especially in smaller sizes. The wire: I suppose ‘colour’ immediately springs to mind here. Certainly changing colours can give you wide range of bugs. Originally brass coloured, we now have a huge range of wire colour options available to us as tiers. Have the confidence to experiment and you’ll find the ones that bring you the greatest success on your rivers. You may even be surprised by the results. Copper, green and red all have their place in my fly box and a change in colour can turn a struggle into a day to remember. Gauge of wire should be matched to the hook size. Trying to cram a thick wire onto a small hook may give you the desired weight, but be careful not to close the gape and limit the hooking potential of the fly. I like to use the loose tag of wire at the end of the body to form a rib. This adds a nice segmented effect, adds extra weight to the fly, avoids the ‘bump’ from tying in the wire onto the hook shank and makes the fly even simpler to tie. Have a look at the step-by-step procedure (Page 3). The thorax: Peacock herl, hare, rabbit guard hairs… The list is endless. I personally like a longer dubbing fiber to create a ‘straggly’, life-like appearance. Kept sparse, this effect is still achieved, but very little air is trapped and the fly is still able to descend through the water quickly. 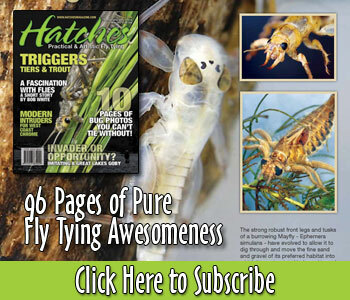 Explore the options a little – try a soft hackle as a further alternative. The ballast: Perhaps the real beauty of the Brassie is that its whole appearance and profile is based around the very material that helps it to function – the wire. I also like to include a bead-head on many of my versions. Tungsten beads are great for adding extra mass in a small package. Whilst a small bead can be successfully added to a tiny version (Sub #20), I sometimes leave the bead off, allowing the wire to add the desired weight. Again, just watch the gape of the hook and ensure it is as open as possible. If you do plan to use a bead on these smaller flies, try off-setting the hook point slightly to give yourself the best chance of a successful hook-up. Whilst the bead’s primary role is to add weight to the fly, a range of colours adds even further options to your tying. There’s a good range of coloured beads on the market now and they are well worth experimenting with. Further, try experimenting with coloured glass beads and see how you get on. Fished singly or as a team under a dry fly, or alongside other nymphs, the Brassie is a top pattern that will help you put fish in the net throughout the fishing year. Experimentation is the key.